French parliamentarians – left or right, including the Socialist Speaker of the House – stick tooth and nail to their perks. The opposition is crying out against what they call being taken back to the times of Robespierre's “Terror” under the French Revolution. François Hollande has the unenviable task of trying to give voters more confidence in their politicians who are generally considered to be corrupt. Of course, the whole of Europe – but is it only Europe? – is today in a sad state. What makes the difference with France is that we revel (or dunk ourselves) in this sad state, that we seem to enjoy it, more anyway than any other nation. According to a recent poll, the French consider themselves as the most unhappy people in the world, even more than the Iraqis! And a majority of them consider that their children will lead a life worse than their own, thanks to the nefarious effects of globalisation. There is a widespread feeling of gloom among the middle classes who benefited greatly from the “Thirty Glorious Years” which followed World War II, predicting a loss of social status, and income. Many feel “déclassé” as well as overwhelmed by a globalisation they fear, rather than trying to overcome it. Of course, globalisation has hit France perhaps harder than other EU members. But it has also benefited us. At least some of us. Thus creating a feeling of gloom and doom incompatible with the real situation. The French love to hate themselves, to deprecate themselves and their own country, or a part of their own kin, pushing self criticism, or self deprecation to a level even the most critical of critics watching France from the outside would never have dared to do. As a former correspondent of the French daily Le Monde in London in the 90’s, I well remember reading articles in the French media describing the sorry state of our own economy at a time when the Financial Times – accused by some of French bashing – was showing us a far less negative, if not sometimes positively constructive vision. Yes, we can’t hide ourselves behind our little finger, as we say. The state of French society, economy and politics is a sorry one. Thirty years of budget deficit, ten years of conservative governments – from 2002 to 2012, under former presidents Chirac and Sarkozy – under which deficits sky rocketed, and almost a year of rudderless Hollande government under which the ruling Socialist Party seems to be its worse enemy, have thrown France onto the ropes. Just a few figures: under Chirac and Sarkozy’s five years terms, the budget deficit has jumped from just under 60% to almost 90%, foreign trade has gone from a small surplus to a 70 billion euros deficit and about a million industrial jobs have been lost, mostly thanks to outsourcing. The false hope in the so called trickle-down economics advocated by Margaret Thatcher and Ronald Reagan has pushed for lower taxes on business and on the wealthiest while controls on tax evasion have been loosened. To not much avail. 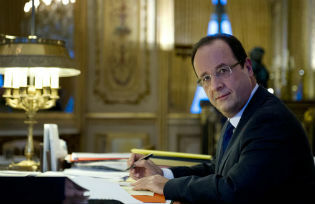 Now the deepening of the crisis has forced Hollande to tighten the screws and increase taxes. But he does not seem to have realised after his election the depth of the crisis, the necessity of taking bold measures, and of showing the flag. Now is the time to act boldly if he does not want his term to linger on in a sorry state. A major scandal has hit his government, as it did that of his predecessors. His budget minister Jérôme Cahuzac, a wealthy cosmetic surgeon, has finally admitted, after months of lying, that he had lied about his undeclared bank account in Switzerland, since moved to safer Singapore, and he has been forced to resign. But now things have changed: François Hollande, who had promised a squeaky clean government, is being taken at his own word and public opinion, hit by new tax hikes as well as by years of drastic cuts on welfare, is not ready any more to tolerate more of the same. It might look strange that budget ministers, supposedly charged to ensure the legality of public finances, have been accused of misbehaviour three times in two decades. First young Nicolas Sarkozy for having been instrumental in illegal financing of the then prime minister Edouard Balladur’s presidential campaign of 1995; the case for having received kickbacks from Pakistan on the sale of submarines is still pending; 11 French technicians were killed in Karachi in 2002 by a car bomb related to the case. Then Sarkozy’s own budget minister, Eric Worth, is being investigated for the sale of a race course at below market prices to a business connection, and for having carried money from senile billionaire Liliane Bettencourt – the major shareholder of L’Oréal cosmetics giant – to finance Sarkozy’s 2007 presidential campaign, of which he was the financial manager. And now, as a cherry on the cake, Cahuzac, the flamboyant liar! Now it is payback time. Hit by this never-ending crisis and disappointed by Hollande’s apparent prevarication, public opinion is looking for results on the economic and employment fronts. But also for blood. So is the right wing UMP opposition, glad to forget its own past misbehaviours and its internecine war to replace Sarkozy as potential candidate for 2017 election. Ministers and politicians’ private finances are now under investigation and will have to be made public. A new public cleansing bill will be released before the end of April. People now demand harsh measures against the so called corrupt elites, including a political class whose long-accepted privileges are now considered unacceptable by a public opinion sick of these blatant inequalities. Earlier this week, and for the first time ever in France, where private income and wealth have always been kept top secret, ministers have been asked to publish the details of their private assets: eight of them having an income of over a million euros, a few hardly anything at all – a good cross section of the French middle classes. Hollande would like the members of parliament to do the same and accept some control on their perks. But this will be difficult as parliamentarians – left or right, including the Socialist Speaker of the House – stick tooth and nail to these perks. The opposition is crying out against what they call being taken back to the Spanish Inquisition or to Robespierre’s “Terror” under the French Revolution. It might be difficult to stop this new trend, which is popular and is attempting to give voters a little bit more confidence in their politicians, widely considered as corrupt. It might also be a way for the government to help forget the Cahuzac fiasco. But it is truly strange to see how difficult it is for the French ruling classes to accept even a minimal democratic control of their privileged way of life, which would only align them with most of other European countries… especially in these times of crisis. Yet, just like the media, politicians are only the reflection – even if distorted – of their own societies, from whence they came and who elected them, with a growing abstention rate. Now is the time of reckoning at a moment when politics and politicians have lost their clout. Just when an unprecedented crisis is shaking our societies to the core and when we are only given a choice between populists making promises they know they can’t fulfil – from the extreme right to extreme left but not only them – and “normal” politicians also from the whole spectrum who are short of vision and charisma. This is also an unfortunate opportunity for extremist movements which, throughout Europe, are raising their heads once again, and gaining popularity among disenfranchised losers of globalisation, but also among the middle classes.